Breakfast cereal is perfect for those busy mornings, and moms on the go. Honey Bunches of Oats with Almonds has always been my husband's favorite, as well as mine. But, Honey Bunches of Oats Tropical Blends is quickly becoming a close second! It is the perfect combination of crispy mango flavored flakes combined with real coconut shavings and coconut flavored granola clusters. Simply put... it is sweet, crunchy perfection! Also, be sure to enter the Tropical Trio Sweepstakes for your chance to WIN a Tropical Vacation, a Year's Supply of Purex, Coupons for Free Honey Bunches of Oats & More! This giveaway will end March 30th at Midnight EST. 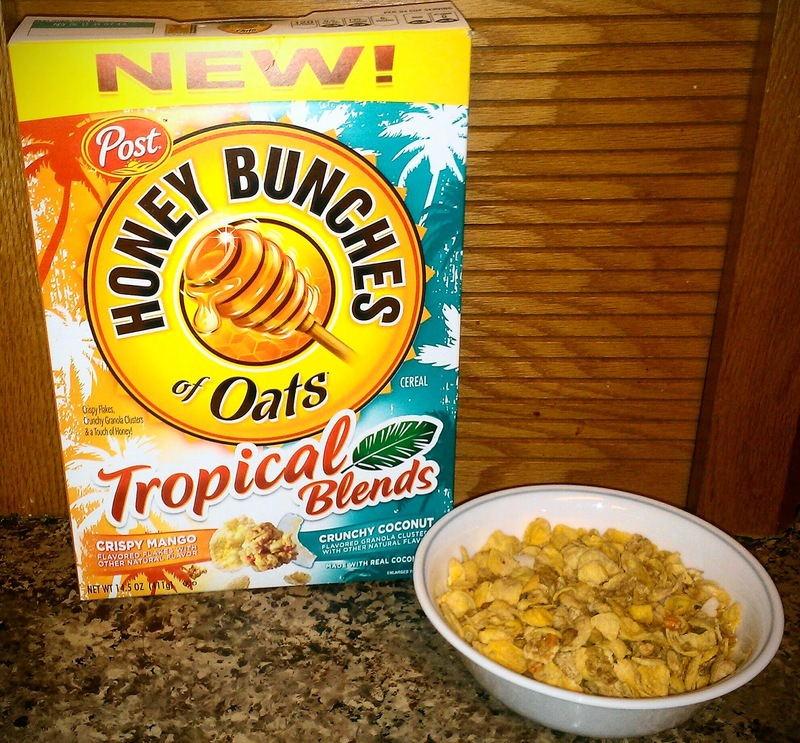 Disclaimer: I received a complimentary box of Honey Bunches of Oats Tropical Blends from Post for the purpose of writing a review and hosting a giveaway. Regardless, I only recommend products or services I use personally and/or believe will be a good fit for my readers. The views and opinions expressed on this blog are purely my own. Results may vary. No monetary compensation was received. My favorite is the Raisin Medley! I like the honey roasted. I would like to try Banana Blueberry. Our favorite is Honey Bunches of Oats with Almonds. We always have it in the house. I love the almond kind!! So good. I saw they have a greek yogurt kind now..would love to try! I would love to try the Raisin Medley. I would like to try banana! I love Honey Bunches of Oats with Almonds! I liked the greek yogurt flavor! I would like to try the new greek yogurt flavor! My favorite is Honey Bunches of Oats with Pecan Bunches. I would love to try Honey Bunches of Oats with Strawberries. Honey Bunches of Oats with Almonds! always get the almonds at costco. always! I love the Honey Bunches of Oats with Cinnamon Bunches!